You are going to have to cope with an awful lot of images of Nottinghamshire over the next few months. Being so close to the Nottinghamshire border, I am taking the opportunity to revisit a number of places in the county that I first visited ten years ago when I was working on my thesis. My aim is to get my CVMA volume completed. The buildings are all as wonderful and compelling as ever, if a little more cluttered with junk than they were. One place I’ve revisited this week is All Saints, Sutton on Trent, which I first came across in 1998. As the name implies, Sutton is situated on the bank of the river Trent. Within the ecclesiastical parish was a vanished hamlet called Meering which is now, but wasn’t always on the other side of the Trent. For much of the Middle Ages the manor of Meering was owned by a minor gentry family who took their name from the manor. However, by the end of the 15th century the family had become extremely rich, by taking advantage of the growth of the wool trade. So rich in fact that by the end of the fifteenth century they were in mixing in courtly circles. In 1497 Sir William Merying was the head of the family and he was made a knight of the body, an honourary body guard to King Henry VII. He would go on to hold the important office of Marshal of Calais between 1509-1511. No doubt his connections with the wool trade helped him get that role. Calais was the centre of the English wool enterprise and his brother Thomas Meryng of Newark was a merchant of the Staple of Calais the body that governed Calais and regulated the trade. 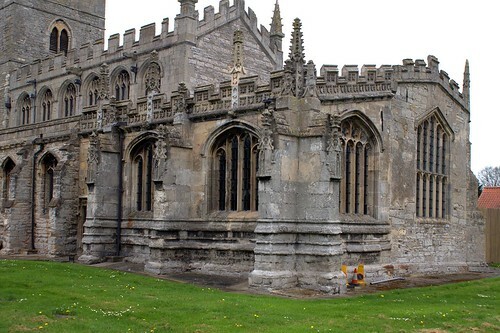 The family splashed some of its cash on church building work. 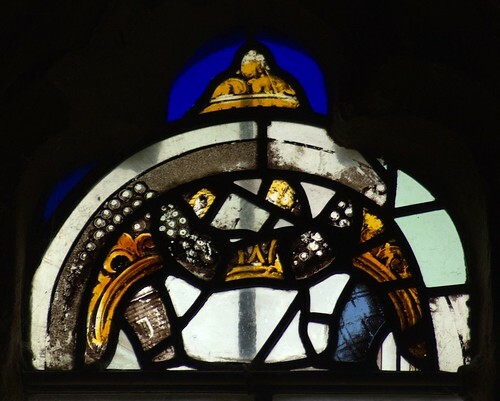 Thomas the merchant built himself a chantry in Newark parish church and paid for the vast east window of that sumptuous building. 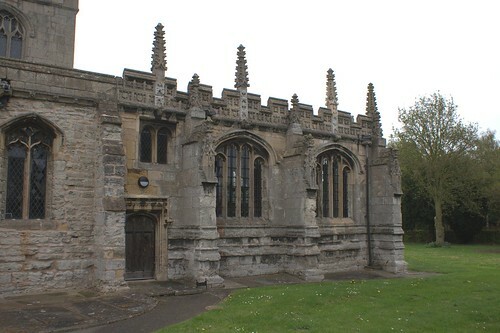 Sometime in the 1520s Sir William decided to extend his parish church at Sutton on Trent with the addition of a new south chancel chapel, which would serve as his mortuary chapel. This glorious little chapel at Sutton is a wonderful example of the syncretism that was common in this period, the merging of late Gothic with the newly emerging Renaissance style. 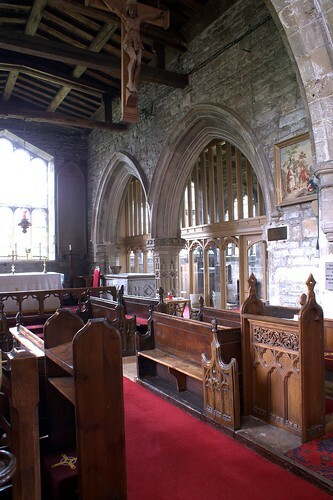 Internally the chapel is divided from the chancel by a two bay arcade and from the south nave aisle by a single four-centred arch. 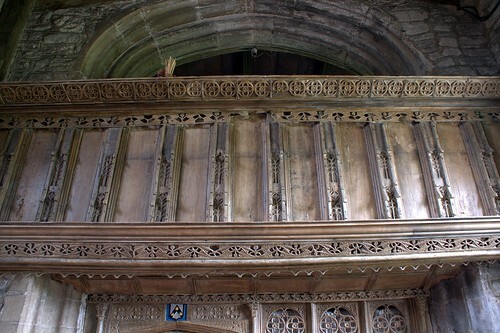 Between the chancel and chapel sanctuaries is a gargantuan tomb chest with a lid of polished purbeck marble. Sadly this has been shorn of its brass inlays, so the identity of the occupant is not known for certain, though it is assumed to be the burial place of Sir William. 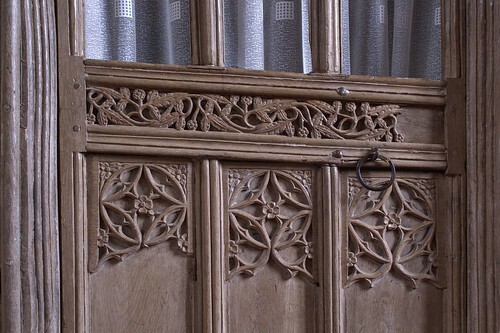 The decoration of the chapel is extremely elaborate, both internally and externally. Externally the chapel has a heavy crenellated and pinnacled parapet, decorated with shields of arms. Decorative pinnacles also grow out of the buttresses. The chapel is constructed of ashlar and as such contrasts with the rubble masonry of the rest of the church building, so when first built it must have had the same visual impact as the Greenway chapel at Tiverton (http://medieval-church-art.blogspot.com/2008/10/in-your-face-mercantile-display.html). 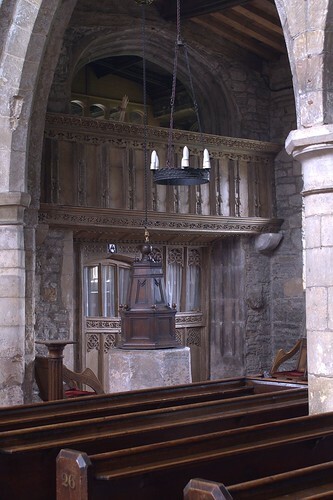 Internally the pillar supporting the arcade between the nave and a chancel is covered with blank panelling. 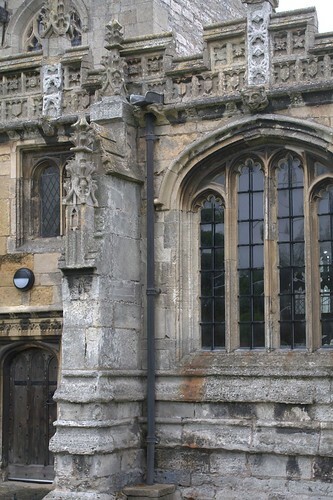 On the south wall of the chapel there is an interesting arrangement a tableau for images, a blank panelled backdrop incorporating three corbels. You enter the chapel from within the building through a heavy parclose screen with its own loft. 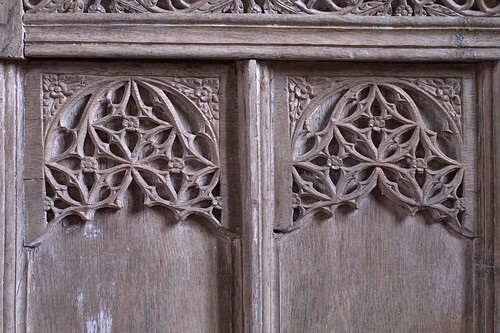 This in example of late Gothic decoration at its most flamboyant, elaborate blank and pierced tracery mix with friezes of lush carved foliage and repeated architectural; motifs. For all this rich decoration there is no ostentation in this work. 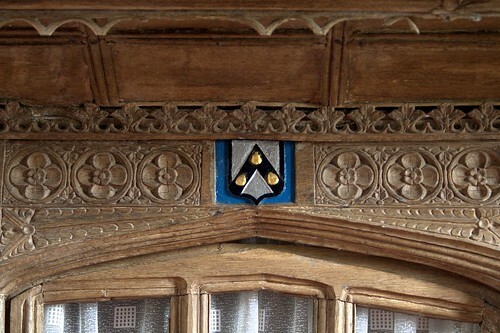 Mering’s patronage of the work is marked with a very discreet coat of arms over the entrance. The wide loft creates, in effect, an ante chapel to the main space and there is an external door giving the Mering family direct access from outside. Did the loft function as a private pew, a bit like the Tudor holyday closet in the chapels royal? It’s tempting to think so. 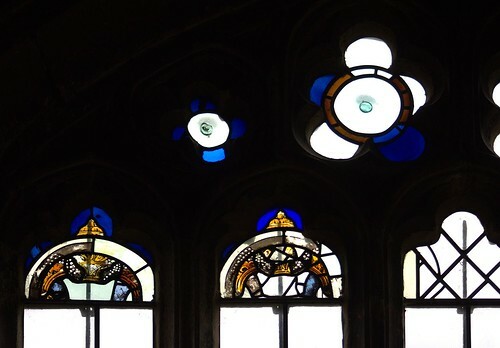 Only fragments of the original glazing of the chapel remain, but what does remain is extremely interesting indeed. 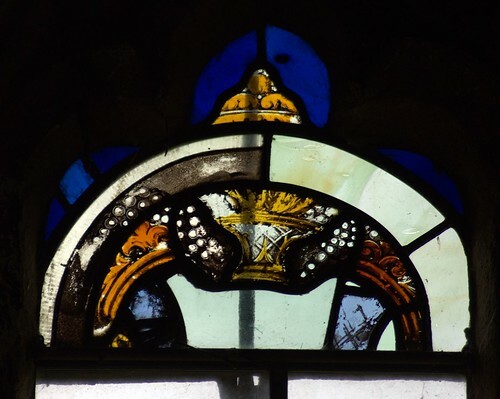 The fragments hint of a very high quality scheme by a continental glazier. The tops of two window lights have renaissance canopy tops, baskets and cornucopia dripping with grapes. In another window other renaissance details, a covered cup and fragments of acanthus. The workmanship is of the highest quality, of courtly quality. Ah the final flowering – glorious. Thank you Alan! Splendid!and wonderful to have you back! Thank you both. It is certainly a building with a touch of the 'fin de siècle' about it. It should be viewed while listening to one of John Sheppard's masses.